Close Combat Martial Arts club is currently closed until further notice. Martial arts builds confidence and character, increases fitness, improving health and provides a fun, social environment for all people to find out what they are capable of. Gain a huge sense of achievement as you achieve your fitness goals, developing your skills through the grades and learn how to prevent harm to yourself and others, regardless of your size and strength, age or gender, without landing yourself on the wrong side of the law. Learn how the law works and about your rights to defend yourself with reasonable force, as there are a lot of myths surrounding what you are and are not allowed to do. Come and train with me in a safe and friendly environment, build on your skills in an intelligent, reality based self-defence system built on rock solid principles, the club is in Pennington, Lymington, Hampshire, but we offer places to anyone living in and around the New Forest. Get fit, get healthy and become the person you want to be. We practice Stand Up fighting (Boxing/Kickboxing) and groundfighting (BJJ) from a self defence perspective, training for every eventually in a street fight ready, self defence system. I joined Close Combat Self Defence around 5 months ago and I’ve learnt so much already. Dave and leighann are just amazing! They are very professional, caring and always making you feel comfortable in everything we learn. They always spend time alone with each student to perfect the skills learned and are always happy to answer questions or give advice in or outside of training. It’s a great class with some amazing students we all help and encourage each other with the new skills we are taught. We always have a good laugh and learn all the skills in a slow well taught manner. I’d recommend everyone giving self defence classes a try. For Anyone that struggles with low self confidence it really does give your confidence a boost with a great sense of achievement!. Plus the first session is free so you have nothing to lose! The lessons are always challenging but extremely fun and a great work out. With a good warm up, boxing, kick boxing, juijitsu it’s a really good mix. I’ve enjoyed close combat so much so that I’ve just started doing two nights per week. 90% of street fights end up on the ground, so what comprehensive self defence system would be complete without learning ground defences? Taken from Brazillian Jui Jitsu and adapted for self defence on the street. you will learn how to control an attacker and exhaust his energy, until its time to end the fight with a lock or choke. Learn how to prevent and defend against attacks in different situations, how and when to react to threats, when to run if you can and and when to submit to muggers who just want money, and how to disarm your opponent without hesitation, with speed and control when there are no other options available, We practice real life situations. All fights start from standing, learn how to defend against every strike, dissuading and avoiding blows, responding with punch and kick combo's until the time is right to take out your attacker. We spar in a safe and controlled environment. You will learn how to prevent and respond to being grabbed from different positions. Contact us to book your free trial lesson. 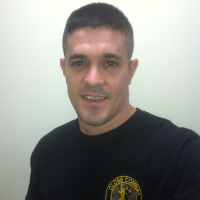 My name is David Close, I have been interested in and practicing martial arts, self defence and preparedness for many years and decided to pursue a career as an instructor, to help people overcome fears and develop skills. I attended Freestyle Combat Karate as a child and competing at the national level, later on in life in 2014 I trained and developed skills in close quarters combat at KAPAP & Krav Maga where I started to help to teach the class and at that point was considering becoming an instructor. More recently I have taken up Kickboxing to keep my fitness level high and joined a family Taekwondo club with my own children, where I help the instructors teach, I then went on to train with the National Federation for Personal Safety (NFPS) where I completed a BTEC level 3 Advanced Award in Self Defence Instruction in October 2016 and the Close Combat Self Defence club was founded and opened its doors for the first time in February 2017.